Black wealth is a major topic on social media. It needs to be. Though there are many exceptions as a collective Black America is at the bottom of the economic totem pole as measured by any credible index. When someone says that Black Americans need wealth to better our position in this society the argument is very persuasive. The issue is the majority of people putting forth solutions. An honest look at the individuals putting forth ideas on how to increase wealth will show plenty of amateur social pundits and maybe some academic types, of which a few might have expertise in wealth building. A few moderately successful business people may offer their suggestions. Let me address that last one because it is more personal. Many people know I have a business channel where I discuss the mindset for running a business, commentary on the business environment, and I discuss specific types of businesses. I rarely discuss wealth building other than a comment here and there. My point is that I don’t consider myself an expert on building wealth because I haven’t built wealth for myself beyond the ability to live beyond paycheck to paycheck. When I’m a solid member of the top one percent that’s when I’ll share with other people how to become wealthy. That brings me to the point of this article. If Black people want wealth we need to collectively take advice from people who have obtained wealth. Here’s the thing again from a personal perspective. I can tell someone how to run a business. Many businesses will still fail. Many other businesses will only be able to sustain a person and they may have the same financial issues as a regular person struggling to make ends meet. A wealthy person who has obtained their wealth through business can tell someone how to actually succeed in terms of building wealth. What we have are struggling folks trying to tell other struggling folks how to become wealthy. An analogy would be a 40 year-old man who has had sexual contact with four women in his lifetime telling a group of other 40 year-old men with a similar level of experience how to be womanizers with a notch count of 300. This happens by the way but that’s another article. This sounds crazy but that’s how it is with people who may be financially struggling telling other financially struggling people how to become wealthy. Like most people I aspired to gain wealth. I’ve read a few books on the subject notably “Think and Grow Rich” by Napoleon Hill. I was still stuck until I did two things. One, I read a book called “Ebony Treasure Map” by Myron Golden, an actual millionaire unlike many of the commenters giving advice. The second thing I did was talk to people who were wealthy. If I couldn’t talk to them directly I would read articles about them and watch any visual media I could locate highlighting their personal stories. Despite what people think there are Black people who are among the top one percent of all earners. Technically if one makes $500,000 they are in the one percent. The overwhelming number of them are not pro athletes or entertainers. 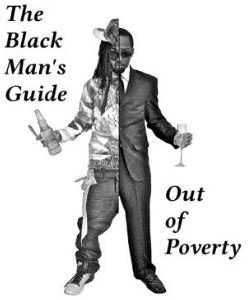 There are Black professionals, business owners and even Blue collar types who are wealthy. They can tell us more than how they made their money. Obviously a millionaire contractor made his money in a different way than a millionaire attorney. They can tell us the mindset they had, the peaks and valleys, and most importantly they show us that someone who looks like us can make it to the top. As a community we need to stop following people who are giving us theories. Personally I’m leery of taking advice from someone who cannot demonstrate how the advice has enrichened their own lives. We need to listen to the people who have demonstrated that their advice works.